Our immigration lawyers offer legal advice to individuals, families, and businesses on a full range of immigration law issues. As members of the American Immigration Lawyers Association (AILA), the preeminent organization for immigration lawyers, our seasoned immigration attorneys will represent you on a wide variety of immigration and naturalization issues, including but not limited to: employment visas, deportation or removal defense, family visas, DACA, special concerns like those related to gay and lesbian immigration, and other immigration services. Although The Shulman Law Group is based in New Jersey, we have represented clients throughout the United States and abroad, thus earning a national and international reputation as being the best immigration attorneys in business. Our lawyers travel to foreign embassies and consulates to directly handle problematic situations for clients. Firm founder Edward Shulman has more than 20 years of legal experience, and has also handled many high profile cases during that time. 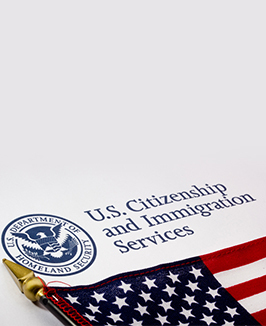 While an understanding of immigration law and procedure is necessary, our immigration attorneys know that consistent communication with our clients is crucial in all matters of immigration law. At The Shulman Law Group, our lawyers strive to always be approachable, responsive, efficient, and effective. We are fluent in English, Spanish and French, maintain flexible office hours, respond promptly to telephone calls, and keep clients informed of the status of their case. Our dedication to quality, understanding of immigration law, trust, and respect are the foundation of our long-standing relationship with clients throughout the world. If you need a visa, wish to immigrate, or want to help bring a family member or employee to the United States, we can help. If you are facing deportation or removal for any reason, you need our help. You may contact our offices for more information or to schedule an appointment with one of our immigration attorneys. Please fill out the immigration questionnaire and bring it with you for your initial consultation with our immigration lawyers.